Spanning 20 ft across and 12 ft high, "The Triumph of David" first arrived at Villanova University in 1956 as part of a larger donation of artworks gifted by the late Princess Eugenia Ruspoli. Due to the painting's complicated restoration history, layers of overpaint and varnish coatings eventually degraded and darkened, causing some to conclude that the painting was beyond repair. In 2013, an interdisciplinary team of conservators, art historians, and scientists were given the opportunity to revisit the work, conducting a preliminary examination of the painting as well as scientific analysis of the materials used to create the large oil on canvas. From 2013 to 2015, conservators slowly revealed the brilliant colors used by the artist that had been hidden beneath several layers of grime, discolored varnish, and overpaint. A comprehensive technical study of the "The Triumph of David" revealed a close connection between the pigments and layering structure found in paintings associated with Pietro da Cortona's circle. Cortona's vast workshop had a significant impact on painters working throughout the seventeenth century. While the technical information suggests the painting was likely painted during this period, other details (such as the weave-structure of the canvas; Cortona's large-format paintings were typically on canvas with a coarser weave) indicate that the painting may have been produced by a painter who was closely affiliated with Cortona and the artist's oeuvre. 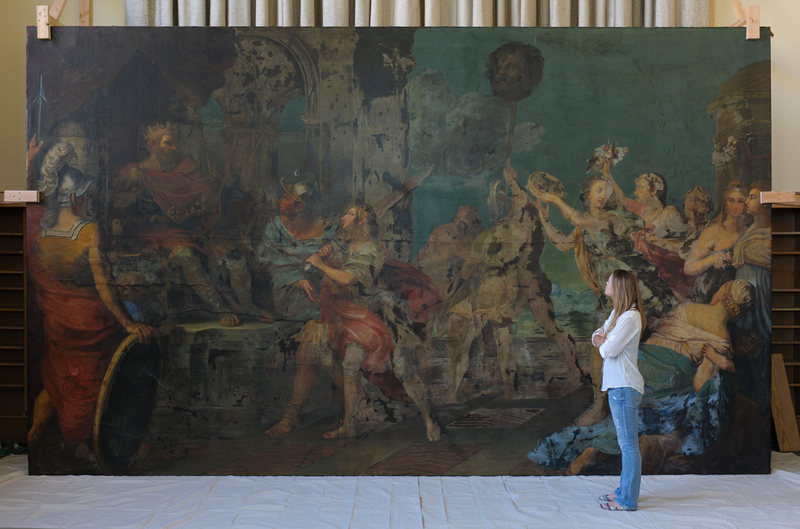 During the 2013-15 conservation treatment, the team was able to trace the painting back to Princess Ruspoli's Castle in the town of Nemi (located just outside of Rome) before it was shipped to the United States before the outbreak of World War Two. The painting's provenance is in need of further investigation and we hope that the information presented here will inspire future research relating to the mystery surrounding "The Triumph of David." Welcome to our website detailing the conservation treatment of Pietro da Cortona's "Triumph of David", a large-scale oil on canvas that currently resides in "Old Falvey," Falvey Memorial Library's original wing. This website features an interactive timeline, detailing a month-by-month examination of the painting's conservation progress. The system takes advantage of sophisticated tools that allow us to superimpose hi-resolution images in context of the larger painting. 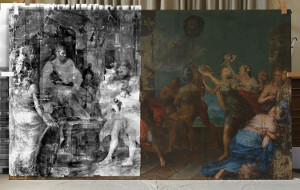 Throughout the 2013-15 conservation treatment "The Triumph of David," several methods of non-destructive imaging and analytical techniques were employed. X-radiography and Infrared Reflectography helped the team to identify compositional changes (e.g. hidden figures, costume adjustments) as well as changes imposed during previous restoration campaigns. X-Ray Fluorescence (XRF) was also performed on several locations of the composition, allowing for preliminary pigment characterization both before and after the removal of unoriginal overpaint and degraded varnishes. The original stratigraphy of the painting (the paint and ground layers) were studied using Cross-sectional Microscopy. A number of microscopic paint samples were collected along the edges of existing cracks or losses and examined with visible and ultraviolet light under high magnification. Using Scanning Electron Microscopy (SEM-EDS), paint cross-sections also helped to inform the conservation treatment by identifying anachronistic pigments (e.g. zinc white) in degraded layers of overpaint.